Shucks. Maybe we'll have to keep paying the electric bill after all. Archaeologists, excavating the ninth-century Maya complex of Xultun in Guatemala, say they have found what may have been a workspace for the town's scribe. Paintings on the walls, they report, appear to include calculations related to the Maya calendar. The researchers, writing in today's edition of the journal Science, say the calculations project 7,000 years into the future. There's no hint that the calendar ends on Dec. 21, 2012, despite popular belief. "Why would they go into those numbers if the world is going to come to an end this year?" said Anthony Aveni at Colgate University, a scholar of Maya astronomy and a co-author of the paper. "You could say a number that big at least suggests that time marches on." Some of the heiroglyphs, painted in red and black, appear to represent regular cycles charted by the Maya, say the researchers - the 365-day solar calendar, the 584-day cycle of the planet Venus and the 780-day cycle of Mars. "For the first time we get to see what may be actual records kept by a scribe, whose job was to be official record keeper of a Maya community," said William Saturno of Boston University, the lead author, in a statement put out by the publishers of Science. "It's like an episode of TV's 'Big Bang Theory,' a geek math problem and they're painting it on the wall. They seem to be using it like a blackboard." Xultún was actually found almost a century ago, but not excavated until now. The structure in which the markings were found has three surviving plaster walls, say the researchers. 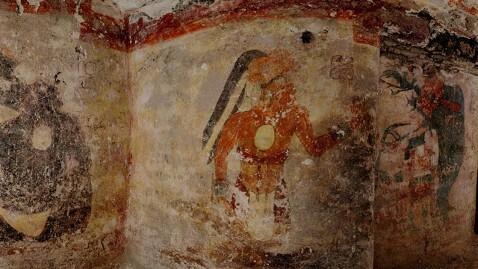 On one wall is a painting of a king, wearing a headpiece with blue feathers. Near him are numbers that correspond to previously-known cycles in the Maya calendar - and others that researchers had not seen before. Saturno and his team say four long numbers on the wall represent one-third of a million to 2.5 million days - up to 7,000 years into the future from A.D. 813, a year scratched into the wall in another place. Saturno, like other scientists who have studied the Maya civilization, says the Maya appear not to have thought much, at least in their writings, about an end to the world. "The ancient Maya predicted the world would continue, that 7,000 years from now, things would be exactly like this," Saturno said. "We keep looking for endings. The Maya were looking for a guarantee that nothing would change. It's an entirely different mindset."